SmartMovie is a popular mobile media player from Lonely Cat Games. They recently released an updated version of SmartMovie player, SmartMovie 4. It can play DivX, mpeg4 and Xvid formats with maximum quality in small mobile screens. SmartMovie 4 package comes with a desktop converter and mobile SmartMovie player 4. 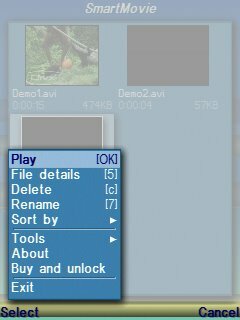 The standard format for playback is AVI ( DivX) . But there is software like DivX player that can play this format for free. From version 4.0, SmartMovie added support for MP4, 3GP and FLV. So now you can play Youtube video files (FLV) in SmartMovie layer 4. You can download the player from the links given below. DivX or AVI videos can reduce the size of any video file, maintaining its quality. SmartMovie was the only AVI mobile player during its introduction. Later DivX Inc. released a free DivX mobile player that affected the acceptance of SmartMovie player. As I said earlier, from version 4, SmartMovie added support for native mobile video formats like 3GP, MP4 and FLV playback. SmartMovie player 4 had a lot of bug fixes for compatibility and memory management issues. It now supports the latest Nokia Touch series smartphones. SmartMovie player 4 has a redesigned interface that almost looks like DivX mobile player. It adapts with the default theme on Symbian mobile phone. New online update feature SmartMovie player 4 lets you to update the software over a suitable data connection. 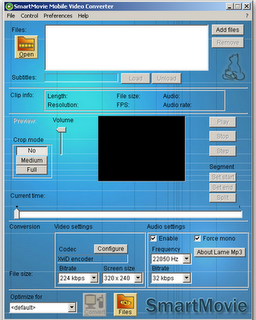 SmartMovie 4 desktop converter . Download SmartMovie player 4 here. You have to use the converter software to convert incompatible videos to mobile media player format and then transfer it to the device using data cable.